Scott says, “Be fair and don’t overburden the speaker. Eliminate “huh” and “what.” Learn to be assertive but not aggressive. You catch more flies with honey than vinegar. Have a variety of repair strategies to fit different circumstances. (Ask for the topic, a repeat or a rephrase as an example.) Be sure to thank the other person for their help and sensitivity, a show appreciation goes a long way. “confirm…CONFIRM… CONFIRM” He says. Repeat back what you heard to be sure you understood correctly. When trying to follow a conversation or instructions, take it in small increments and set the pace you need. Stop speakers sooner than later if you didn’t understand because believe it or not, you’re wasting less time. Knowing a topic can increase your understanding of a conversation by 50%. Here, he provided us with a lip reading exercise. He silently mouthed 5 words without giving us a topic. I got all of them wrong. Then he told us the next five words would be ‘fruit.’ I got all but one right. The funny part of this, the first set of words were the same fruit. Peach looks like another word altogether if a little body language is thrown in. He sure threw us off there the first round. Guide conversations by initiating topics but don’t dominate conversations, he warns. We can also lead communication by asking better questions. Ask yes and no types of questions and closed set or limited set questions. Get precise enough to get simple answers. “Effective questions will limit what you need to lip read…and makes it easier!” Finally, instead of “What” or “Huh,” repeat back what you heard and ask for the missing piece, saving energy on both parties. Or better yet, ask for a rephrase. Improve your environment paying attention to lighting and acoustics. Create a communication environment. He showed us pictures of beautiful rooms which promoted sound bouncing all over the place making it more difficult on our ears. How do we improve our rooms? Have curtains instead of blinds, a throw rug over wood floors, big, fluffy pillows and furniture. Plants and books also help soak up sound. How about looping the living room, aren’t we worth it? Where are we on the assertive scale of one to ten? Some of us may be a bit too shy and other might be too demanding. 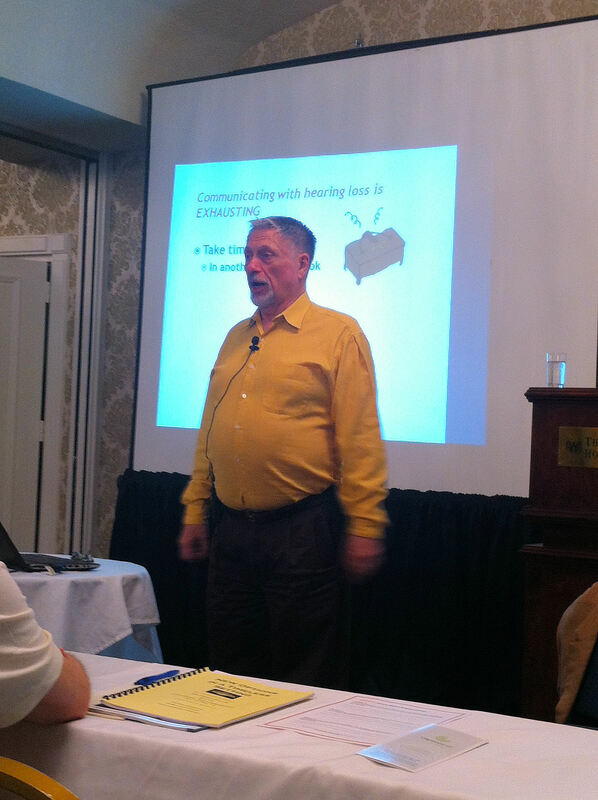 Scott suggests being clear with your request and provide a reason (being upfront about your hearing loss). Use courtesy instead of anger. An example he provided, “If you trim your mustache, I’ll do dishes for a month” vs “It’s me or the mustache!” How would you like to be asked? Trying to hear for hours at a time is exhausting. It’s okay to take time outs, he says. Walk around the block, take a mental nap, slip into a quiet room. Let your ears and brain rest and he even gave us permission to fake it once in a while, especially if it’s Aunt Bessie telling the same story for the 100th time. He advises us to be well rested before big hearing events too. #9 Give Yourself A Break. “Change what you can, don’t frustrate yourself trying to change the unchangeable.” Look for things you can change in your environment. Can you change a mumbler? (See # 5) Or someone with a mustache? You can ask them to trim it but they may refuse. Don’t bang your head on a brick wall. Remind a fast talker to slow down with a prearranged hand signal telling them you really do want to know what they say and want to hear every word. Hearing loss is only part of the problem. Things like loud music in restaurants, everyone talking at one and acoustics compound the problem. Some people have long mustaches, accents, are soft talkers or fast talkers. Communication is a two way street. Make our needs known, keep a variety of strategies at our disposal and we can get along in society. We are smart people because we are constantly filling in the missing pieces. “It’s more than lip reading! It’s visual plus auditory plus context plus linguistic knowledge. 2 + 2 = 5,” he tells us. This entry was posted in Coping Strategies, Hearing Loss and tagged communication strategies for hearing loss, hearing loss and communication, Scott Bally. Bookmark the permalink.